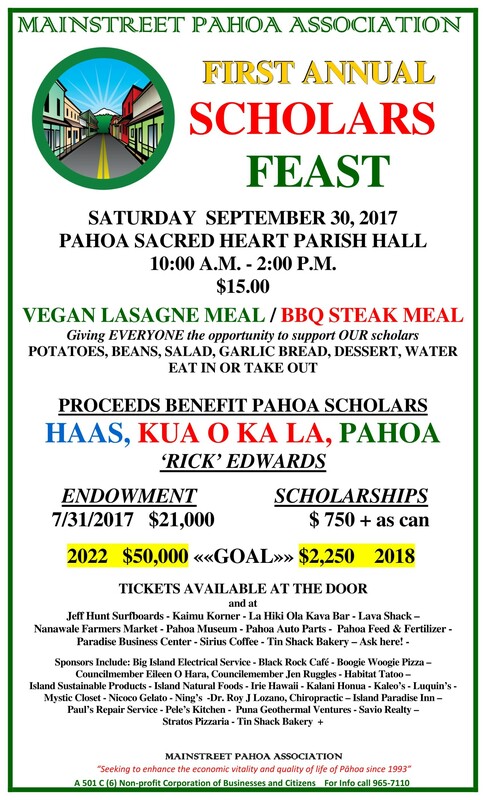 Tomorrow is the final organizational meeting for the biggest fundraiser of the year for the Pahoa Schools Scholarship Fund….the steak and vegan feast. Please step up and get involved, if only thru your credit card. This is important stuff. Attached you will find the poster for the event…..Saturday, September 30th, at Sacred Heart Church from 10am to 2pm…. full steak or vegan lasagna meal for only $15. You’ll find below links to the agendas for the 4 Committee Meetings of the County Council to be held in Kailua-Kona at the County’s West Hawaii chambers. The Committee Meetings on on Tuesday, Sept. 19th and the Council meeting is on Wednesday, Sept. 20th. You can also testify remotely by email to counciltestimony and from any of the remote video conferencing sites (Pahoa Council Office, Waimea Council Office, Kohala, and Na`alehu. Bill 13 – The limited polystyrene ban is up for its 2nd read on Wed. Sept 20th. It passed first read with a 7:2 vote, so let’s hope it fares as well on its second read! Councilmember Jen Ruggles will be taking testimony on Bill 47, a proposed Bill that would expand Farmer’s Markets to our Public Parks around the Island, including Pahoa’s new park. Currently only Kailua-Kona, Waimea and Honoka’a parks are allowed to have farmer’s markets. This needs to be expanded to include most all of our Parks. This allows locally grown produce to be sold locally within our communities. Bill 47 was introduced by County Council Chair Valerie Poindexter and Seconded by Vice-Chair Karen Eoff. funding to Rainbow Friends for spay and neuter clinics. Council will have meetings in Hilo May 16 & 17. There has been a spike in confirmed rat lungworm cases recently in Hawaii. Puna, on the Big Island, has been dealing with threats of rat lungworm disease since 2004, and now Maui has seen recent cases of rat lungworm disease (tragically, two of these recent cases was a couple on their honeymoon!). The introduction of the invasive semi-slug species in Puna is correlated with rat lungworm disease cases. Rat lungworm is a parasite that humans can contract by ingesting infected slugs and snails. The rat lungworm parasite lives out its life cycle between rats and slugs and snails. The slugs eat rat poop which contains the parasite, and in turn, the rats eat slugs/snails. When a human gets infected, the parasite travels up the spinal cord into the brain where it lives out its life cycle (i.e., you have worms growing in your brain trying to find a way out). There is no cure and it is difficult to diagnose, and it is thought that there are many unreported or unconfirmed cases. Symptoms can be debilitating and severe- and can even lead to death or permanent disability. The disease can cause meningitis, excruciating nerve pain, paralyses, inability to urinate, and more. If you prepare your own food and eat raw local greens, thoroughly wash and check each INDIVIDUAL leaf for slug slime or slugs. Those of you staying in vacation rentals with kitchens will need to have extra awareness if you prepare your own meals. Remove each leaf by hand- do not cut first- you can accidentally cut a little slug in half and not notice it that way. Baby slugs are very tiny and hard to spot. Rinse, repeat, and rinse again with potable water. Some greens like kale are really difficult to clean thoroughly- I would recommend not eating kale raw unless if you are meticulous about checking every little fold in the greens. Washing with vinegar does NOT kill the parasite. Some have recommended soaking greens in ice water before cleaning, which helps harden any slugs and makes them fall off. Couldn’t hurt to try, as long as you wash each leaf by hand after. Wash any fruits or vegetables you eat- don’t eat fruit right off the tree or veggies right from the garden. Always wash with potable water. If you are staying at a vacation rental that is on catchment water, don’t use it as drinking water. Buy bottled water or refill water jugs with city water (there are public water stations around that you can fill up at). Cooking or freezing greens kills the parasite. If you’re into kale smoothies, why not just throw your kale into the freezer for a day? Then you’ll know for sure that it is safe to ingest. Or, cook them! This way you can still eat healthy and also rest assured that you will not have any risk of rat lungworm disease. Do not handle slugs with your bare hands or walk barefoot in the jungle. We know that the parasite can travel through abrasions on the skin, so theoretically, if you have cuts on your hands and you handle a slug and the slime goes into your cut, you could be infected. A small number of the parasites can be found in the slime of slugs and snails. Be careful eating salads at restaurants and any potlucks/gatherings. You might want to ask the waiter if they use local greens and if they use rat lungworm prevention strategies. Most typical restaurants will use greens from Costco which are imported from the mainland, so the risk of contamination is a lot less. Don’t stress out too much about it or cancel your trip! If you are aware, you can avoid the parasite. The State of Hawaii Department of Heath has not done a good job at helping spread awareness of this terrible parasite which they should be ashamed of. If tourists are aware of the parasite, they can know to take necessary precautions!